Academic assertiveness is an essential capability that is required of students who wish to achieve academic and professional success. 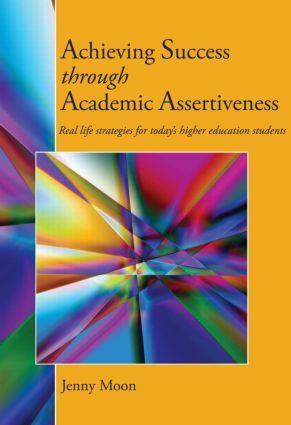 Written for students who are aiming to achieve college success, Achieving Success through Academic Assertiveness: Real life strategies for today's higher education students focuses on the challenges that learners face and encourages positive actions that support triumphs in learning situations. Jennifer Moon creatively explores the importance of this emerging topic and how assertiveness is linked to the process of learning and overall student development, critical thinking and academic achievement. Learning to Cope: Fight, Flight or Be Assertive! As a Human, You Have Rights and Responsibilities . . .